-Each of the Hybrid Tattoo Pen is CNC-Machined by aircraft Aluminium alloy and then anodized finish.The motor is 4.5w made in Swiss,low noise,strong and stable to work, no hot for long time working. -Operating Voltage: 7–12V DC. This Hybrid Tattoo Pen can be compatible with Cheyenne Hawk power supply and all other brands tattoo power supplies, you will get an plug adapter to work with all those power supplies. -Connection: DC 5.5mm Jack plug cable, free plug adapter to fit all brands power supplies. 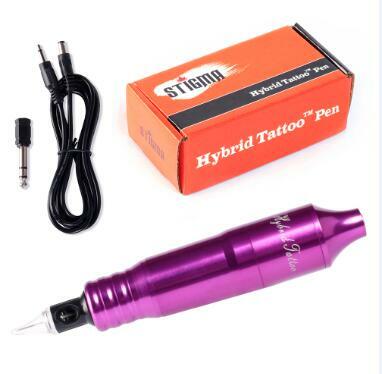 -Package including: 1 Hybrid Tattoo Pen,1 connection line,1 Jack plug adaptor,1 needle cartridge.